The simple yet contemporary Marby twin-over-full bunk bed is a modern classic, featuring an streamlined solid pinewood frame complimented by a rich coating of lacquer, available in deep espresso, warm grey or bright ivory. Manufactured with support you can rely on, our Marby bunk bed features heavy-duty built in wood slat support and the thick pinewood frame is secured with heavy-duty screws, eliminating wobbling for sound stability. 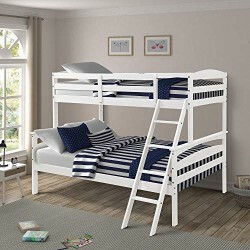 Designed with safety in mind, this bunk bed has a heavy-duty weight capacity of up to 330 pounds on top and 660, while also including full length gridded guardrails that run alongside the upper perimeter. An integrated ladder with thick treads seamlessly blends into the bed frame and is positioned at a slight flat angle for easy and safe maneuvering up and down. Variety is the spice of life, and our Marby twin-over-full bunk fits the bill perfectly, giving you two different bed sizes in one. The size difference creates a visually stimulating appearance while leaving your space feeling more open and less crowded with open space between the stacked sizing variants. Capable of easily separating in two separate beds, the Marby bunk is designed to adapt to and accommodate your changing needs.